This is a nice conclusion to the first arc of the Level Up series. It resolves most of the big plot points while leaving lots of room for future ones. 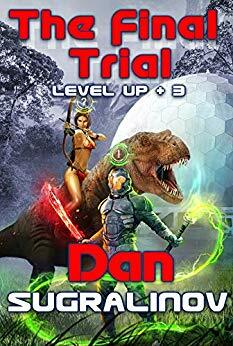 Phil, the main character (MC), finally faces the big test that will determine if he can keep the life changing interface the alien’s installed. This tests adds a new narrative that feels more like a traditional LitRPG story with a specific hex capture ‘game’ that has to be won. There’s action, strategy, base building, and PvP fighting. At the same time, the real world social storyline is not abandoned and continues to develop with a new villain popping up there too. For me, while I thought the game test added some action-adventure, I still liked the real world storyline better. It is what I’ve come to appreciate about the series, the speculative journey of how an RPG interface would be used by people. How’d they’d try to exploit it for their personal gain or to help others, the social and economic conflicts, and the unintended consequences. It doesn’t sound exciting when I describe it, but it very much is. Overall, a good story that I stayed up much to late finishing.